Perhaps Adams’s interest in the aesthetics of her room, and her desire to redecorate it, was a premonition of her interior decorating and designing career. During her lifetime Adams designed fifteen homes, many near Vassar, and was an early worker in the emerging field of interior design. 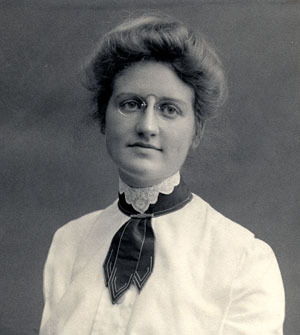 Ruth Maxon Adams was born in Beloit, Wisconsin, in 1883, and grew up in New Haven, Connecticut. After graduating from Vassar Phi Beta Kappa in 1904, she began taking part-time courses at the New York School of Applied Design for Women (now Pratt-Phoenix School of Design) in 1910. Women in architecture were rare in the early 1900’s. By 1910 about thirty professional schools of architecture existed in the United States, but most of them did not admit women. At the New York School Adams studied interior decorating and drafting skills and became influenced by the English Romantic style of William Morris and his Arts and Crafts movement. Interior decorating had just become an independent profession around the time of Adams' enrollment at the school. She opened her own interior furnishing firm in New York City (which she later relocated to New Haven) in 1915. Adams’s professional relationship with Vassar began in 1914, when she renovated the Guest Room in Main Building. In 1915 she designed her first house, the Fahnestock-Peebles home, for two Vassar professors. The house has been described as having a “European vernacular quality,” with large windows to “usher the environment inside.” Vassar historian Elizabeth Daniels ’41, who lived in the house from 1952 to 1998, said of its airiness, “It’s like living in a tree house.” Adams designed five other Vassar faculty houses, including the Barbour House in 1922 and the Dean’s House in 1932. The extensive correspondence between them in the Vassar archives demonstrates that President MacCracken and Adams were good friends and collaborators. In 1937 Adams supervised the renovation of Ely Hall. MacCracken, inspired by the aulas—spaces for academic meeting and discussion—of many Spanish universities, hoped to convert the Ely Hall gymnasium into a space for informal social gatherings and debates. To facilitate such activities, Adams lengthened the windows to let in more light and furnished the newly christened Aula accordingly. Adams was also the architect of MacCracken’s summer cottage, whose construction Adams is said to have supervised herself, stone by stone. From the 30’s to the early 40’s, Adams was commissioned to decorate and furnish the social and reception rooms in most of the residence halls at Vassar. In 1939 she noted in a delighted memo to MacCracken that she was able to completely change Lathrop parlor’s color scheme since the entire parlor was reconstructed that year. Besides decorating the halls’ social spaces, Adams also furnished Kenyon Hall and the President’s office. Over 60 years have passed since Adams worked at Vassar, and none of her interior decoration remains. Blake, Clarence. “Miss Ruth Adams.” Cornwall Journal. 19 March 1970. Halpern, Phyllis. “Ruth Adams ’04: Architect Discovered.” Vassar Quarterly. Fall 1977. 16-20. Van Lengen, Karen and Lisa Reilly. The Campus Guide: Vassar College. New York: Princeton Architectural Press, 2004. 110.